One out of every two Russians (54%) believe the Russian-Ukrainian border should be open and should not have any visas or customs, but 30%, on the contrary, favor closed borders and visas, the Levada Center told Interfax. The poll, which surveys 1,600 people in 134 populated areas in 46 regions of Russia, was conducted on May 22-25. Ten percent of the respondents believe Russia and Ukraine should unite to form one state. Sixty-four percent of the respondents said they are positive about Ukrainians, 25% said they are negative about them, and 11% were undecided. Eighty-six percent of the respondents said they are negative about the current administration of Ukraine, 6% said they are positive about it, and 8% were undecided. 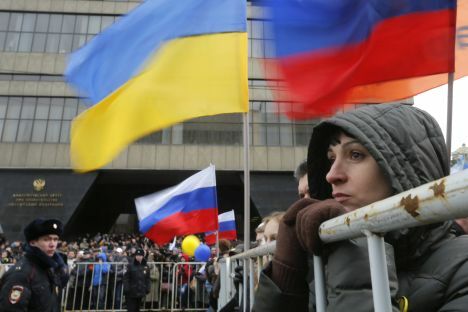 Fifty-one percent of the respondents said they are afraid about the possibility of a war between Russia and Ukraine, 29% said they are not very afraid about it, and 12% said they are not afraid about the possibility of such developments at all. Forty-eight percent of the respondents said it is not likely that military clashes in eastern Ukraine will develop into a war between Russia and Ukraine and 14% rule out such a possibility. At the same time, 4% believe it is inevitable and 28% believe it is very probable. Fifty-five percent of the respondents said they are afraid of the possibility of a war between Russia and the West and 25% said they are not very afraid about it. Twelve percent of the respondents said they are not afraid of such a possibility and 8% said they are undecided. Fifty-one percent of the respondents said it is unlikely that the current military clashes in eastern Ukraine will develop into a war between Russia and the West. Eighteen percent believe it is totally ruled out. At the same time, 22% believe it is quite probable and 2% believe it is inevitable.